← Bon Anniversaire cher Marquis! 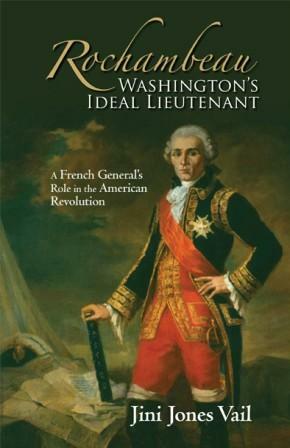 Jini Jones Vail’s Rochambeau, Washington’s Ideal Lieutenant is a well researched book whose central figure is the top commander, appointed by Louis XVI, the king of France, as leader of the military force (expédition particulière), who is sent to help the American Continentals win independence from British rule. It is a fascinating documentation of the important and crucial role that the French played, both monetarily and militarily in the defeat of the British at Yorktown. The author does an excellent job of describing the prevailing conditions, and the life experiences of the participants at that time. I recommend this book to anyone who is interested in American history to learn more about Rochambeau’s important contribution to the American cause. Jini Jones Vail has written a most appealing historical account of France’s General de Rochambeau’s role in the American Revolution. In the Preface (p.XXI) she says, “the research and writing of distant history is not an exact science” yet her scholarly research, evidenced by notes, glossary and bibliography, gives the reader a wonderfully readable historical account of the relationship between Rochambeau and Washington as the American War for Independence moves down the eastern seaboard to Yorktown, Virginia. Though Jini Jones Vail’s audience must not be limited to “east-coasters” those who do reside along the eastern seaboard will find charming references to towns, homes and perhaps ancestors with whom Rochambeau visited. The past comes alive as do the personalities of Rochambeau and Washington through anecdotes and the personal correspondence between them. They have become men whom you might have or wish to have known. Even knowing the final outcome of the war, it is its unfolding in this most enjoyable book that pushes one to turn pages to accompany Rochambeau on our country’s journey toward independence. A Great Read for All Ages.